Disclosure: Excited about working with Whirlpool on the #ItsAllCare campaign. I received compensation but all opinions expressed are my own. Check out more great content at Every day, care™. Teachers care so much for our kids, so I love giving a little care back to them! Whirlpool is encouraging everyone to show the fun and unconventional ways they care every day, whether it be cooking, cleaning, or washing. 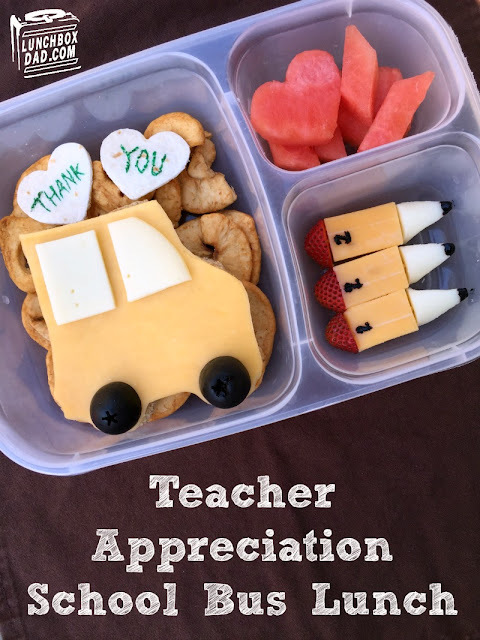 Since this is National Teacher Appreciation Week why not make a lunch like this to show your teacher how much you care for them? Your kids can even get in on the lunch making! 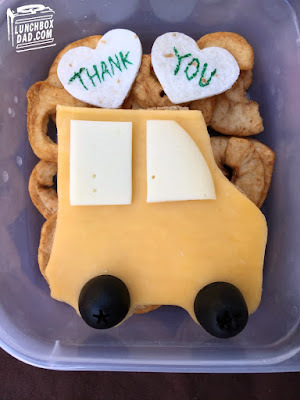 My daughter helped make this lunch for her teacher, and not only did she love making it, her teacher definitely felt appreciated and cared for. Follow the instructions below to easily put this together and then check out whirlpool.com to see the unique ways others care for the ones they love. Also, feel free to share the way you care for others using #ItsAllCare on all of your social media. I love this idea and program, because these seemingly small acts of care can change the world! 1. Use any bus shaped cookie cutter on two slices of bread and a piece of cheddar cheese. 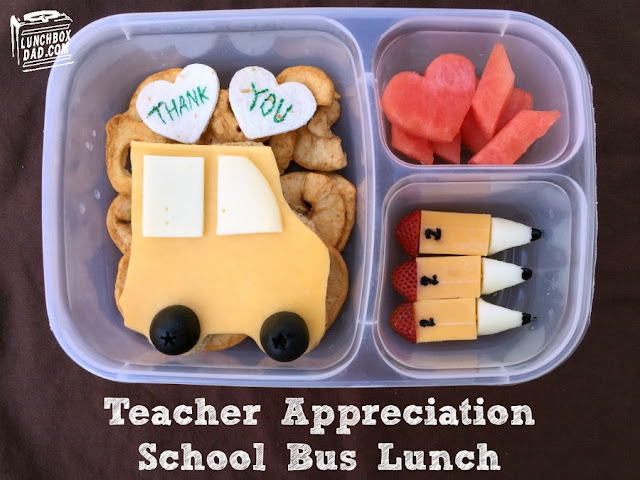 You can also cut the shape out free hand or cheat by using a cookie cutter shaped like a truck and make it look like a bus. 2. Arrange dried apples in main dish. On top of apples, place one slice of bread in, then the piece of meat, then the other slice of bread, and finally the piece of cheddar cheese on top. 3. Cut a bus windshield and bus window from slice of white cheese as shown. Slice an olive in half. Place bus windows on cheddar cheese bus and olives halves for the tires. 4. Cut pieces of watermelon in the shape of those chubby old pink erasers. Use a small heart cutter to also make a watermelon heart. Arrange in side dish. 5. Cut cheddar cheese stick into three pieces. Repeat with white cheese stick. Cut each white cheese stick piece into a cone shape. Cut the end off three strawberries. 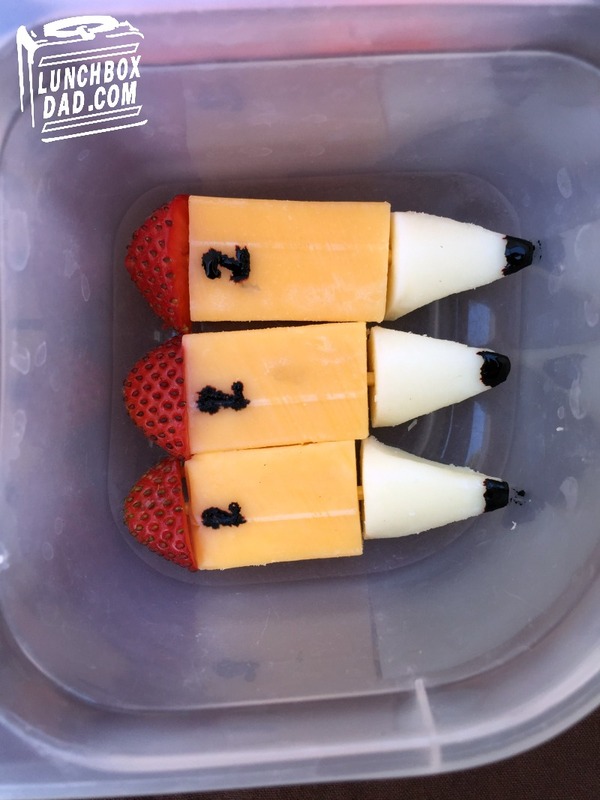 Use a toothpick to stick white cone on end of cheddar cheese stick and strawberry on other end. 6. Dip very end of cheese pencil into black food coloring. Use a toothpick to write "2" below the strawberry eraser. Place pencils in side dish. 7. If desired, you can cut heart shapes out of tortilla and use green food coloring or green food coloring marker to write "Thank You." Place just above the bus. Let's Play Ball with a Lunch and a Fun Game!